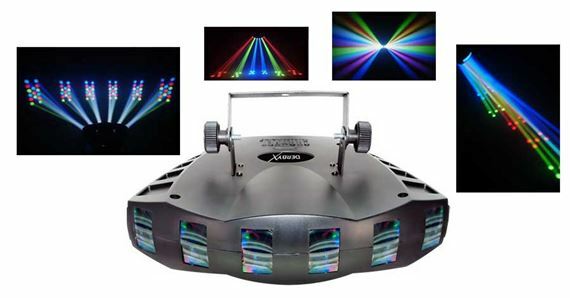 Shop Chauvet DJ Derby X LED Derby Lighting Effect from AMS with 0% Interest Payment Plans and Free Shipping. The Chauvet Derby X LED Derby Lighting Effect features individual control of all 6 LED clusters. With the Derby X you have blackout/static/strobe, built-in automated and sound activated programs and linkable power for up to 27 units. The Derby X is yet another affordable, great quality effect light from Chauvet. Awesome one day shipping. Great patterns, great sound pick up. I use it on a daily basis. Being in a rock band our stage performance is very important to us as our light show. Investing in the lights we purchased was a great choice. We plan to purchase more thank u AMS. Added so much to the show!! This is a very compact, portable unit that doesn't need a genius to operate, just plug and play! It definitely exceeded my expectations with a great light show!